I write as the last light of day is fading to the west and we are temporarily forced to stop in Lock E10 on the Erie Canal. Today has seemed so significant in its adventures, trials, and rewards, that I wanted to share it with you in “real time” (or as close as we can get). The C.L. 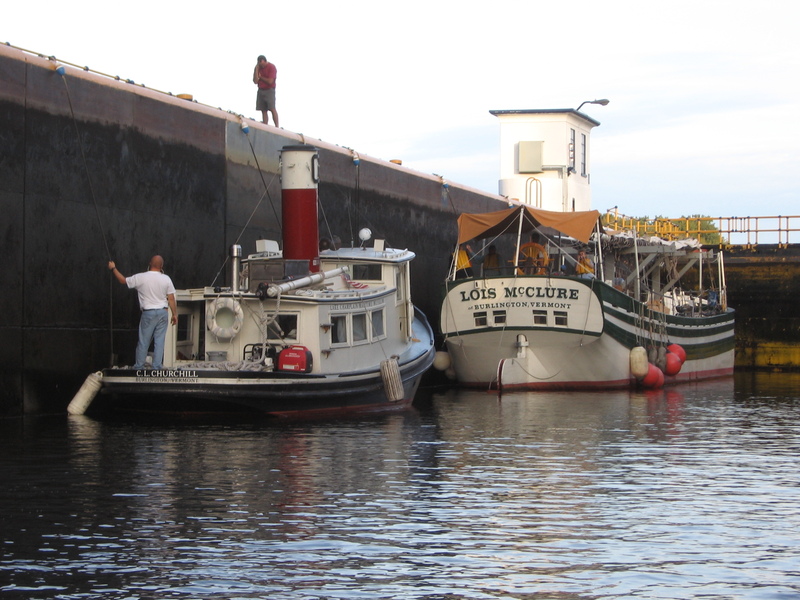 Churchill— the 34-foot wooden tugboat given to us by the Shelburne Shipyard in 2005 to support the Lois McClure’s travel schedule—is the best boat I have ever known, maybe in the world. She has taken us around Lake Champlain three times, down the Hudson River to New York City, to Buffalo via the Erie Canal, and to Quebec City and Montreal via the St. Lawrence and the Richelieu Rivers. This year, we have traveled almost 1,000 miles in a return to the Erie Canal that has brought us to twenty wonderful communities and the World Canals Conference in Rochester, New York. We are now on our way home, preparing to finish this three-month trip with school programs in Waterford, Schuylerville, and Whitehall. That is, until two hours ago, when I put the Churchill into reverse… and nothing happened. We had made it all the way to Lock E10, one short of our goal, and were fortunately already in the lock, almost completely stopped, when this misfortune struck. We looked over the stern to make sure that nothing was lodged in the propeller (we’d been dodging floating debris all day). No problem there. We just had the transmission rebuilt this spring—could it be that something within the transmission case gave way? That would be catastrophic. Andy, Kerry, Erick, and I checked the transmission and found everything okay. Finally, we found the culprit: a coupling in the drive shaft that is held by a soft brass “key” had worked loose and given way, allowing the shaft to slide aft and out of the drive position. Erick phoned our great friend, John Callaghan, who then phoned another great friend, Canal Corporation Director Carmella Montello, and within minutes, the Canal Corp was gearing up to provide us with extraordinary assistance. 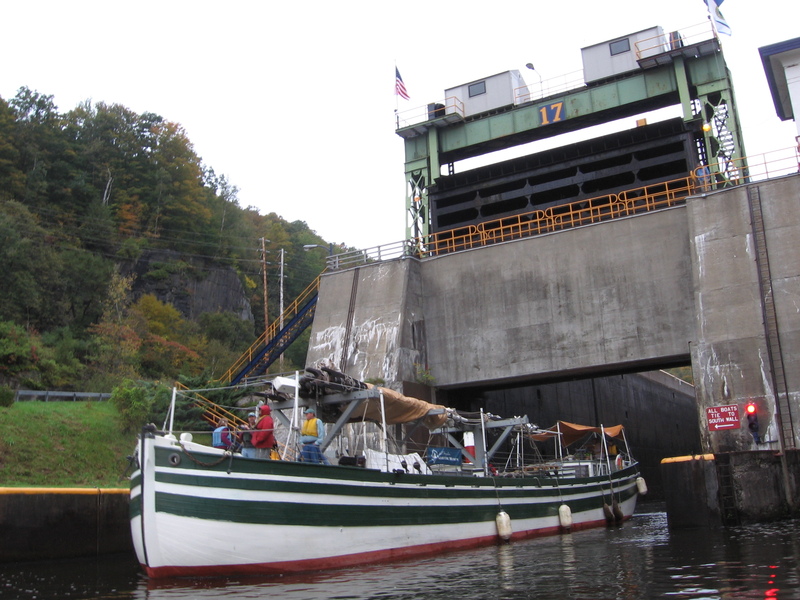 The lock tenders, who have always been helpful, are going out of their way to assist us now. Despite our unexpected stay, they have been extremely gracious and left the facilities at the lockhouse available to us. Erick has been taken to a Canal Corp machine shop, with the broken parts in hand, to meet a machinist to fabricate a replacement key and two set screws. 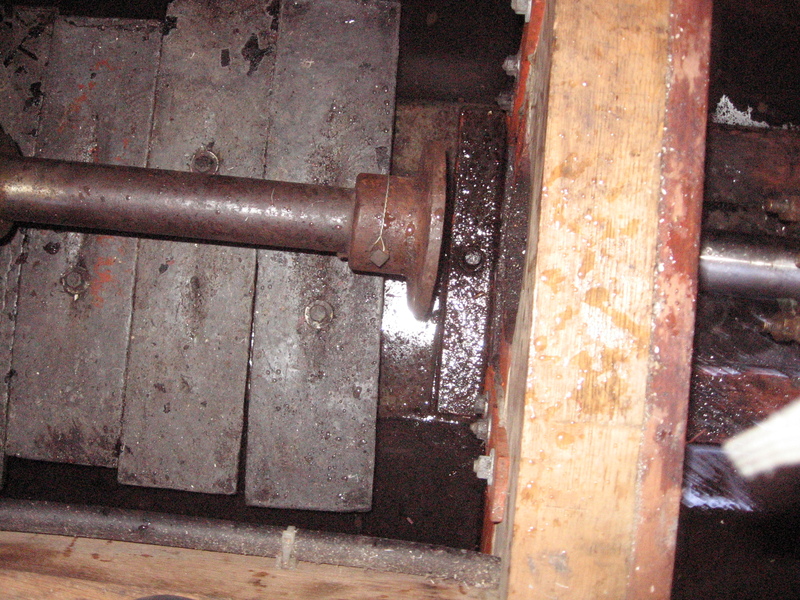 We are standing by in the lock, and, presuming he is successful, I soon will be diving in the lock and under the Churchill to push the shaft forward and back into position with its new parts installed. If that operation goes well, we will continue on our way in the morning—probably in the rain—to get into the Waterford Flight so that we can continue our journey, come heck or high water.